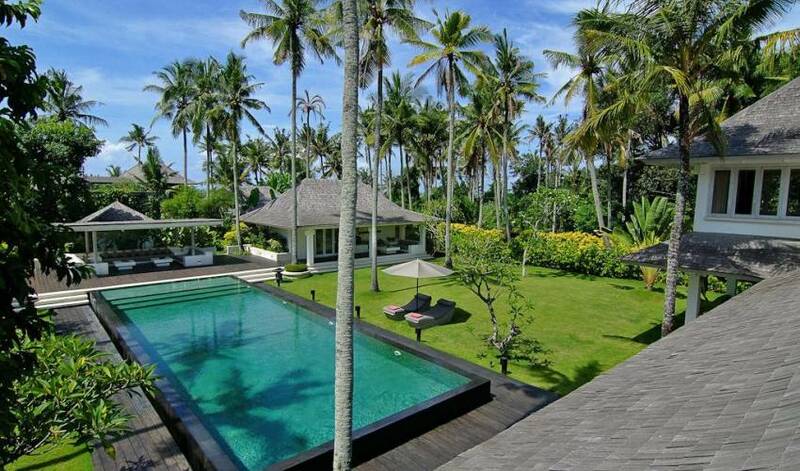 Villa 3178, located just footsteps away from the beach in the traditional, seaside and exclusive fishermen village of Seseh on Bali’s southwest coast. The village, surrounded by a government protected rice field’s green belt, is becoming the preferred destination for high end customers, who prefer to: live immersed in the untouched traditional Balinese culture; enjoy almost private and unspoiled beaches; ride the waves in Seseh surfing spots; taste fresh fish provided directly from the fishermen; assist to real Balinese ceremonies in the local temples, and relax in a tranquil atmosphere, but without renouncing to the luxury of some of the most stylish and luxurious Villas in Bali, and to the proximity of the busy areas of Kuta and Seminyak. 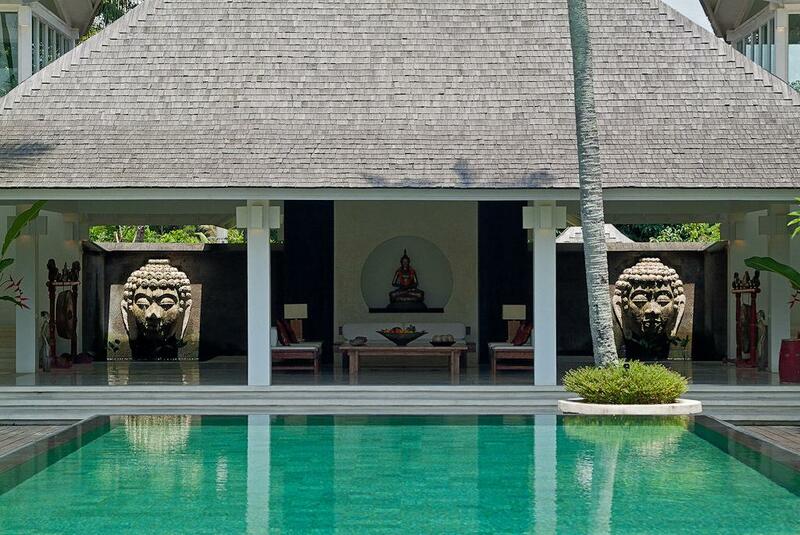 Seseh retains the customs and culture of old Bali. Cows are herded through the fields, rice is planted and harvested throughout year, and the sound of ritual music is carried on the breeze. Villa 3178 is a sumptuous, two storeys, four bedroom villa, characterised by open air tropical living rooms and an abundance of light, glass and space. This contemporary property embraces symmetry and exudes style, fusing some of the traditional Balinese architectural elements: like the pavilions, and the four sloped roofs with the modern concept of space and featuring crisp white walls, white terrazzo floors, iron wood shingle roofs and decks, and high quality furnishings. 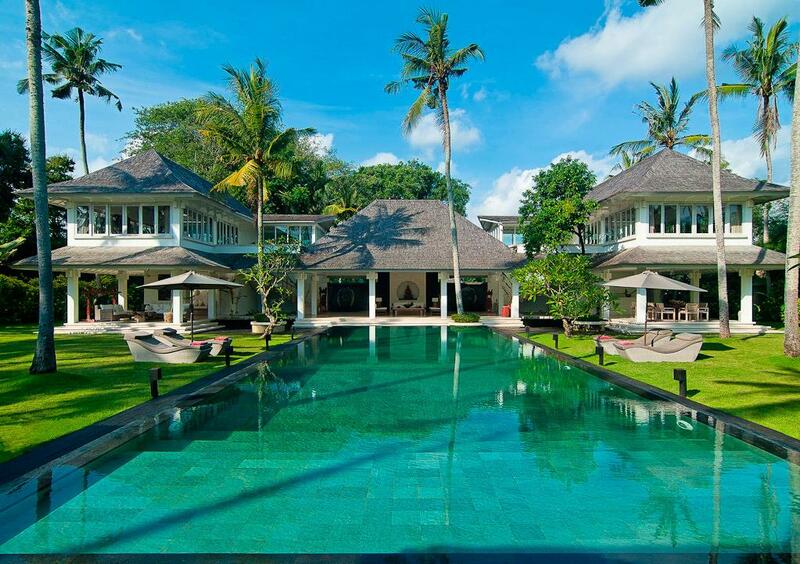 This luxurious property is ideal for weddings and events. 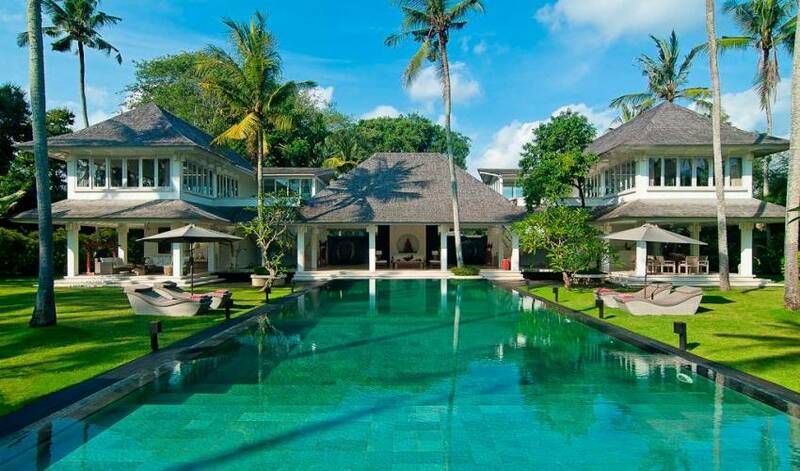 It was completed in 2009 and has an interconnecting garden door to its sister villa 3179, which presents a contrasting décor and theme next door. 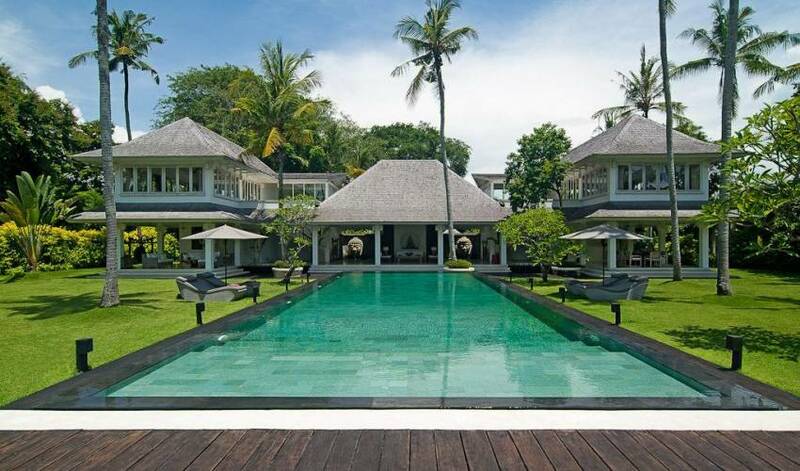 Both villas can therefore be rented together, presenting accommodation for up to 18 people. There are four air-conditioned bedrooms with expansive ensuite bathrooms. The two Master Suites are located upstairs with beds oriented towards the beach, and there are two independent Garden Suites on a single storey pavilion. Every suite has audio visual facilities with LCD screens, satellite connection, internal telephone system, safety boxes, as well as an outside private chillout area. The open air living & dining area takes up the whole of the ground floor, incorporating a lounge with a flatbed TV, DVD player and Sound System, and a Tea and Coffee living area perfect for reading or just taking a relaxing nap after lunch. There is also a fully equipped kitchen, a laundry room, a storage room, staff room, 2 auxiliary patios, a Security Gazebo and an office for internal management. Internet access and an 18 m x 6,40 m swimming pool. The Master Suites are stylish, minimalist and extremely spacious, each is flanked by a private, open air, roof terrace for relaxing. The Master suites bedrooms feature large windows on three sides overlooking the garden. The king size bed in each room is oriented towards the sea, and there is a built in desk behind the bed. The expansive ensuite bathrooms are each fitted with a luxurious bathtub beside a wide window. There is a toilet on one side and a walk in rain-shower on the other side. A wide terrazzo vanity unit supports twin washbasins, and huge wall mirrors multiply the space. Fitted wardrobes provide plenty of hanging and storage space. Despite the abundance of windows, guests’ privacy is cleverly protected by one-way mirror glasses. The Garden Suites are each furnished with a king size bed, built in desk and fitted wardrobe. Sliding doors open to the ensuite bathrooms, each of which is fitted with double washbasins, a bathtub, a toilet and walk-in rainshower behind separate doors, as well as a long wall mirror, and built in shelves. Glass doors in the garden suites open onto timber decks in private back gardens, while another set of glass doors opens in each onto a sitting area overlooking the pool. Each of the Garden Suites have an iron wood deck terrace with a private open air but covered chillout area, designed for relaxing and for enjoying private meals. This Iron wood deck guides to the swimming pool deck, to the main chillout, and to the other Garden Suite located at the other side of the swimming pool, giving it a sense of unity and reminding the deck of a port. The main access to the house, leads to the entrance hall through two huge ironwood sliding doors, that when opened, allows to see a handmade stone waterfall with the symbol of the house, The Hall is flanked by two ponds with two enormous `made in situ´ white stone Buda heads, acting as waterfalls. The living and dining room area is open on three sides and covers most of the ground floor of the main building. The open plan design incorporates a TV lounge, accessed by wide stepping stones over an ornamental pond and furnished with a daybed, complete with flat LCD TV, DVD player and a sound system. The living area itself is the central focus. Aligned with the swimming pool and overlooking the garden, it is cooled by three ceiling fans. 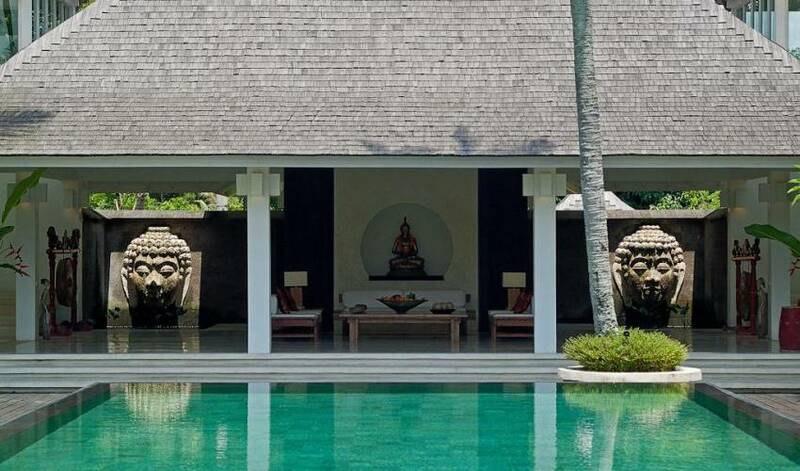 Presiding the space, there is a sitting Buddha which is lightened during the night and reflects in the water of the swimming pool, giving and extraordinary sense of tranquillity. The dining area is accessed by another set of stepping stones over an opposite pond with golden fish inside, and is furnished with a table for ten. There is also a guest toilet on the ground floor. The fully equipped modern kitchen is self contained and located close to the dining area for ease of service. It contains all of the facilities that the chef requires for the preparation of delicious meals, innovative buffets, and party snacks. Fine crockery and cutlery are complemented by a set of glasses for every type of drink. The fully equipped modern kitchen is self contained and located close to the dining area for ease of service. Villa 3178 offers internal spa services, including: facials, body treatment, various types of massage, pedicure, manicure, etc. provided by professional therapists on request at an extra charge. The office, for private use of the staff, is located on the ground floor of Villa 3178 with direct access to the entrance of the house to avoid bothering the privacy of the guests and giving service to the villa and/or guests needs. 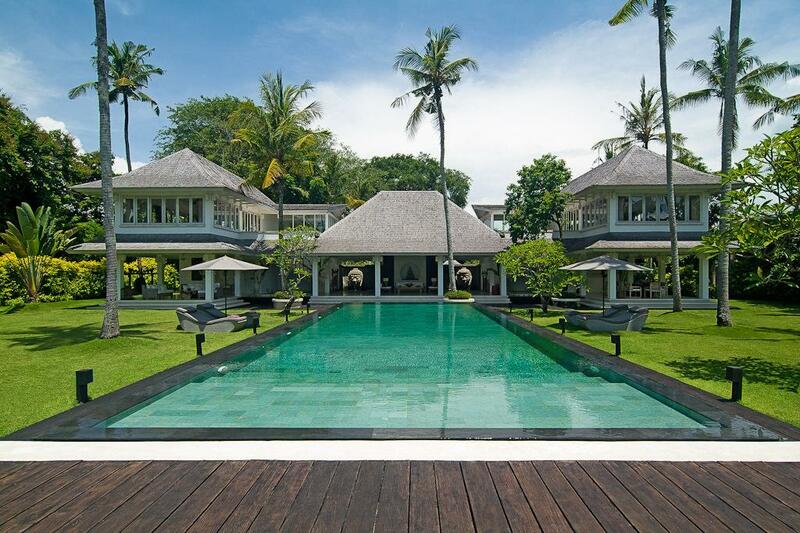 The 18 m. x 6,40 m. swimming pool is a stunning feature, which completes the symmetry of the property. The swimming has a 4 side overflow that simulates a flat mirror over the black volcanic stone of the external walls and light green stones on the inside. 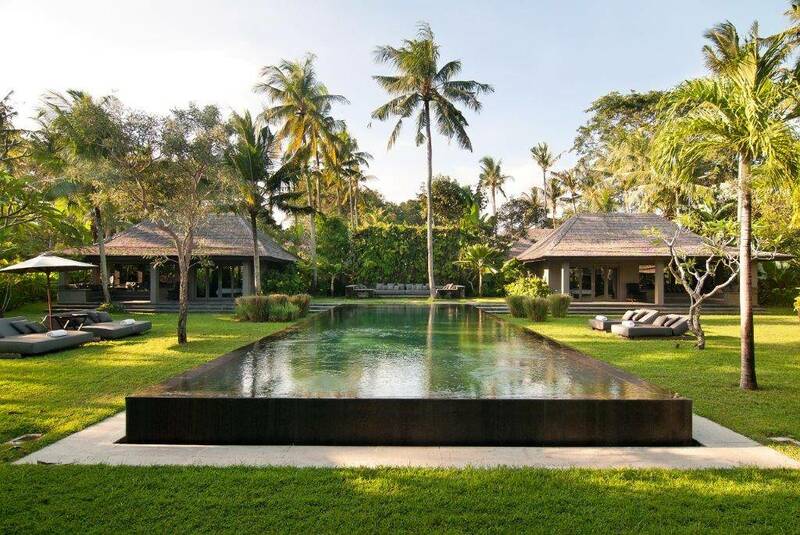 The interior green stones aided with the light of 10 powerful pool lamps invite to swim during the night when the magical atmosphere of Villa 3178 is revealed. The pool deck flanked by a pair of atmospheric, gas-fired firebowls, which are lit at sunset, the meticulously designed illumination of the villa, the reflection of the Buddha in the water, and the moon light through the coconut trees will give you so many nights to remember that you would like to come back every year. The large garden with its flat lawn is ideal for weddings, and celebrations. 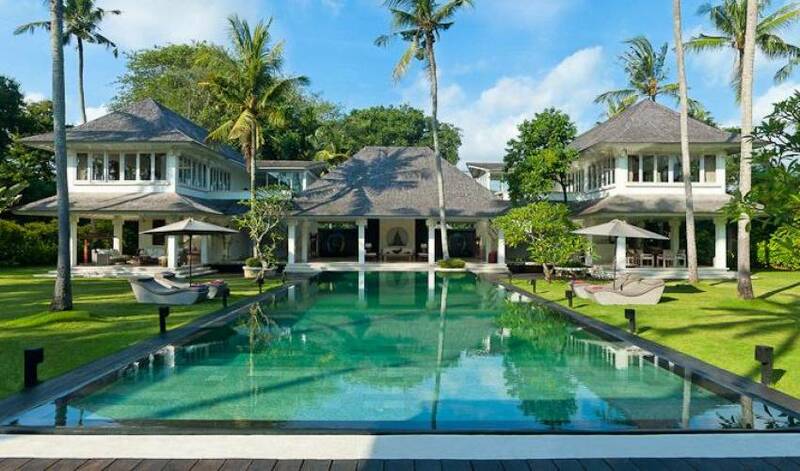 A central, open air lounge presents an additional chillout area; it is sheltered by a roof and presides over the pool. 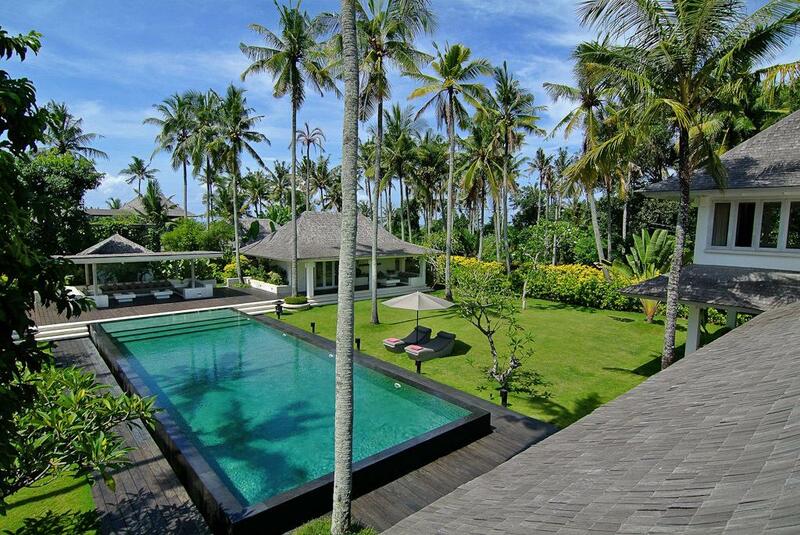 The location offers direct access to the beach and easy access up to the mountains and rice terraces on the western slopes of the island; it is 40 minutes drive from the famous cultural and artistic town of Ubud, just 20 minutes drive from Seminyak and the Sunset Road, gateway to the eastern side of the island. It is only 5 minutes away from Tanah Lot, one of the main temples of Bali. 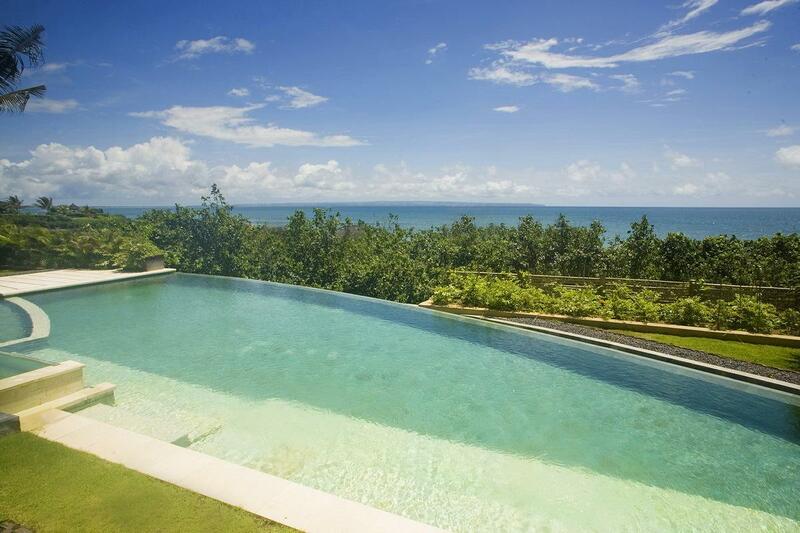 It is also convenient for all of Bali’s shopping malls and main tourist attractions. The international airport is 50 minutes’ drive, depending on the traffic. The nearby ‘Nirwana Bali Golf Course’ designed by Greg Norman, and voted the number 1 golf course in Asia it is situated beside the dramatic waved-lashed sea temple of Tanah Lot. Echo Beach at Canggu, which is bordered by a surfing reef and noted for a casual and lively beach-side dining scene, is a pleasant onekilometre walk along the seashore. This is the place where the local community gathers in the evenings to watch the legendary sunsets. A variety of eating areas and tables spill out onto a beachside buff; there is a daily barbeque and live music on Sunday evenings. He will be your main contact for any doubt, advice, or problem may occur during your stay in the House. He is in charge of the staff schedule, accounting and assistance to the manager. your drivers, the pickups, transfers to/from airport, your massages, excursions, etc. Assists the House manager on his duties and will assist you when he is absent. our chef will provide an extensive Menu for your tasting and will do all the necessary market shopping. 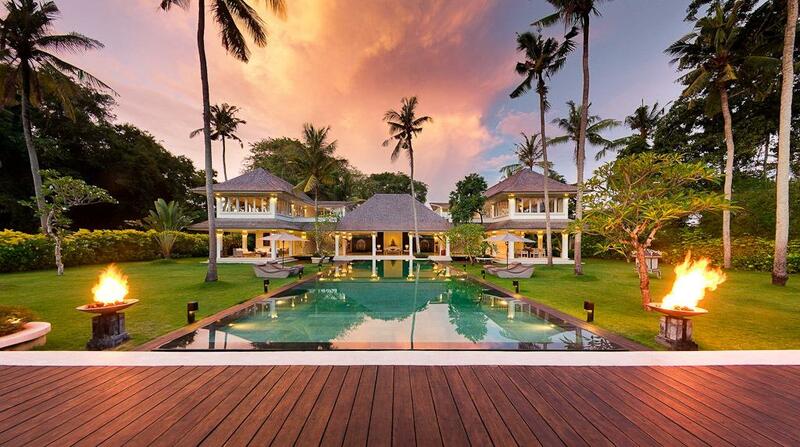 Responsible of tending the pool, garden, and the grounds of the villa. to patrol the grounds and guard the entrance of the villa from dusk to dawn. of the staff is resting.